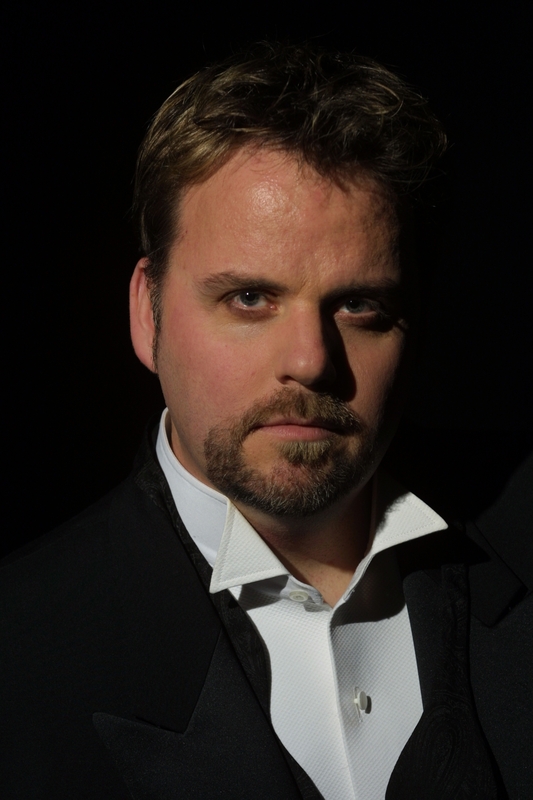 David Rogers-Smith is highly regarded as a performer of both classical and operatic repertoire and music theatre. He joined the ensemble of the Australian production of THE PHANTOM OF THE OPERA in 1993, understudying the role of the operatic tenor, Ubaldo Piangi. After giving performances in this role regularly he joined the Asian/African touring production of LES MISERABLES, playing Brujon and understudying the lead role of Jean Valjean. During LES MISERABLES‘ Cape Town season, however, he was invited back to Australia to appear as Piangi in the Australasian touring production of THE PHANTOM OF THE OPERA, a role he sang some one thousand times in Brisbane, Adelaide, Auckland, Melbourne and Perth. Other roles during this early period of his career included Kromov in the touring production of THE MERRY WIDOW oppposite Marina Prior and the Ziegfeld Tenor opposite Caroline O’Connor in FUNNY GIRL for THE PRODUCTION COMPANY. In 1999 he starred as Buddy Plummer in FOLLIES IN CONCERT at the CROWN SHOWROOM opposite Nancy Hayes and John O’May, he made guest solo appearances in A NIGHT AT THE OPERA for INDEPENDENT CLASSICS, A NIGHT AT THE OPERA and FORBIDDEN BROADWAY. He also appeared in the cast of CHAMBERMADE OPERA‘s season of GAUGIN-A SYNTHETIC LIFE in the 2000 MELBOURNE INTERNATIONAL FESTIVAL. David Rogers-Smith made his operatic debut in the role of The Slave in the MELBOURNE FESTIVAL‘s 2001 season of SALOME featuring the KIROV OPERA. Of his performance of the lead role of Michelle in THE SAINT OF BLEEKER STREET for MELBOURNE LYRIC OPERA in 2003 the HERALD SUN wrote, magnificently sung and brilliantly portrayed. He also appeared in the title role of Mozart’s THE IMPRESARIO for EMOTIONWORKS, appeared as soloist in Mozart’s REQUIEM for ST. PATRICK’S CATHEDRAL in Melbourne and was soloist for concerts for the BAROSSA MUSIC FESTIVAL, with the MELBOURNE YOUTH ORCHESTRA and with the AUSTRALIAN POPS ORCHESTRA at the SYDNEY OPERA HOUSE. 2004 included his debut in a concert of music by Andrew Lloyd Webber with the SYDNEY SYMPHONY ORCHESTRA at the SYDNEY OPERA HOUSE, further concerts with the MELBOURNE YOUTH ORCHESTRA, performances of Andrew Lloyd Webber’s REQUIEM with ROYAL MELBOURNE PHILHARMONIC SOCIETY, the title role in Britten’s cantata, ST. NICHOLAS with the GEELONG CHORAL SOCIETY, appearances as soloist in BEST OF BRITISH for the AUSTRALIAN POPS ORCHESTRA at the MELBOURNE CONCERT HALL and in CAROLS AT COMO PARK. The same year also saw the start of his ongoing association with MELBOURNE OPERA, singing the lead role of Pinkerton in MADAM BUTTERFLY, performances he repeated for the company in 2005, the SUNDAY HERALD SUN writing, powerful and lusty… a fine characterisation. 2005 also included guest solo appearances in the MELBOURNE TOWN HALL PROMS SERIES and the MISSA CRIOLLA for the NATIONAL BOYS’ CHOIR at HAMER HALL, Melbourne. From 2006 to 2009 David Rogers-Smith toured in the role of Piangi in the international production of THE PHANTOM OF THE OPERA, singing in over two thousand performances in Taipei, Hong Kong, Brisbane, Sydney, Perth, Adelaide and Auckland. Most recently, during 2010, he returned to MELBOURNE OPERA to sing the lead tenor role of Canio in I PAGLIACCI and Pinkerton in MADAM BUTTERFLY. In 2011 David Rogers-Smith sang the roles of Danilo in THE MERRY WIDOW, the title role in Gounod’s FAUST, and Don José in CARMEN and all for MELBOURNE OPERA a role he has continued to sing for the company into 2012. He made his debut with VICTORIAN OPERA, in the roles of Jules and Greenberg, in its season of Sondheim’s SUNDAY IN THE PARK WITH GEORGE in 2013, and has appeared in CANBERRA STREET THEATRE’s premiere season of FROM A BLACK SKY performances of which CANBERRA CITY NEWS wrote, Rogers-Smith giving an absolutely sublime performance… Rogers-Smith is simply breathtaking. Also during 2013 he made a 12-performance tour of music theatre concerts in China and during 2014 returned to the role of Pinkerton in MADAM BUTTERFLY for MELBOURNE OPERA and to VICTORIAN OPERA to appear in the role of Alex in its world-premiere season of THE RIDERS and as the Steward and Cinderella’s Father in the company’s season of INTO THE WOODS. He has appeared as Pirelli in VICTORIAN OPERA‘s season of SWEENEY TODD and has returned, for a further four-week concert tour, to China during 2015. 2016 included VICTORIAN OPERA‘s premiere season of BANQUET OF SECRETS in Melbourne and Brisbane. For MELBOURNE OPERA, in 2017, David Rogers-Smith appeared as Captain Corcoran in HMS PINAFORE and concert appearances include the NATIONAL BOYS’ CHOIR‘s performance of the MISSA CRIOLLA and Charles Gaines’ SOUND TEXT for the MELBOURNE INTERNATIONAL FESTIVAL. During 2018 he appears as the tenor soloist in HEIDELBERG CHORAL SOCIETY‘s performances of CARMINA BURANA and in Puccini’s MESSE DI GLORIA for the STAR CHORALE.